Perhaps among some of the most astonishing buildings in the world are those cut from living rock. Known as rock-cut architecture, buildings like this can be found all over the world from Myanmar to Ethiopia and many contain priceless works of ancient art. Some of these incredible carved caves date back thousands of years while others are surprisingly a bit more modern than you’d think. These 15 buildings carved from colossal cliffs, monoliths and volcanic rock are breathtakingly beautiful and a fascinating look inside the traditions of cultures long gone. 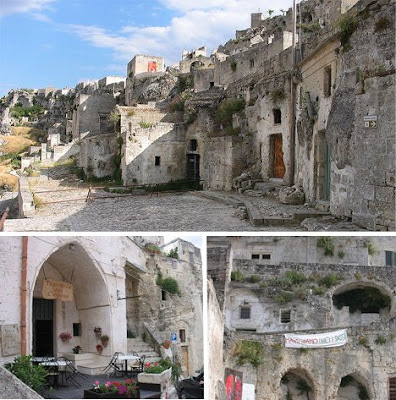 In the ancient rock city of Matera in southwestern Italy, people live in the same exact homes that their ancestors did 9,000 years ago. 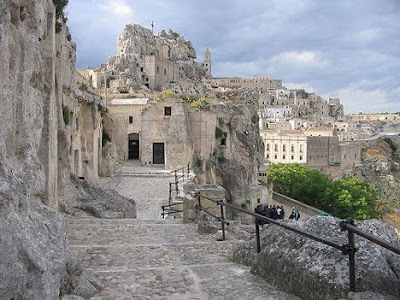 Matera was created from a rocky ravine and the many natural caves in the area – called the ‘Sassi di Matera’ – were the first houses of the Neolithic inhabitants of the region. 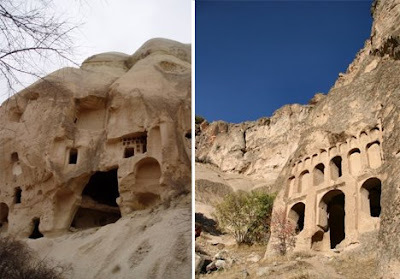 The caves create a labyrinth of houses, and it’s practically impossible to distinguish the natural rock formations from the ancient architecture. The houses seem to sprout from the rock in an organic way, creating somewhat of a tourist attraction from what was in the mid 20th century a ghost town. Matera was notably the setting for Mel Gibson’s film ‘The Passion of the Christ’. Dozens of caves in the Po Win Daung hills contain a treasure trove of carved Buddhas dating from the 14th to the 18th centuries. The hills have been occupied since the dawn of human inhabitation of Myanmar – formerly Burma. 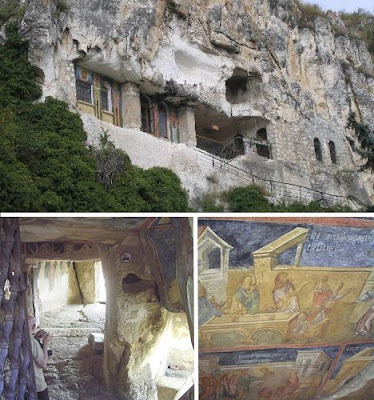 Within the caves you can see 4,000 murals, and take a covered stairway up a hill to the main cave shrine. 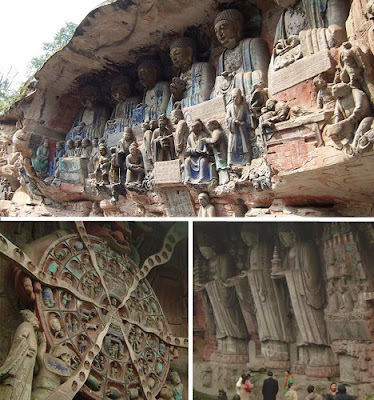 Intricately carved Buddhas act as pillars within the caves as well as sentinels outside the entrances. 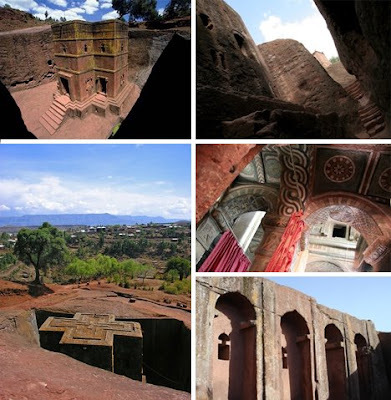 Among the most amazing structures carved from living stone are the churches of Lalibela, Ethiopia. 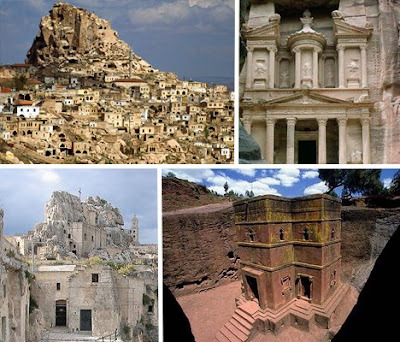 11 rock-hewn churches have each been carved from a single block of granite with its roof at ground level. 12th-century King Lalibela commissioned these churches with the goal of creating a New Jerusalem for those who couldn’t make the pilgrimage to the original city. Each church was created by carving a wide trench on all four sides of the rock and then painstakingly chiseling out the interior. The largest among them stands at 40 feet tall. The stunning rock-cut temples of Ajanta in Maharashtra, India, are among India’s most underrated treasures. Hollowed out of granite cliffs on the inner side of a ravine in the Wagurna River valley, the caves consist of two complexes: monasteries and sanctuaries. They were excavated between the 1st century BCE and 7th century CE, and contain paintings and sculpture considered to be masterpieces of Buddhist religious art. 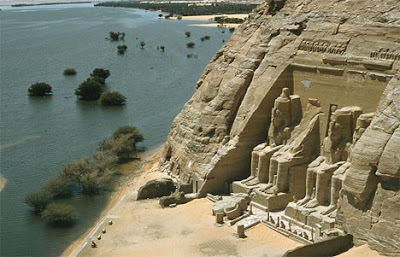 Four colossal statues of ancient Egyptian Pharoah Ramesses II guard the entrance of Abu Simbel, a temple cut out of the sandstone cliffs above the Nile River. 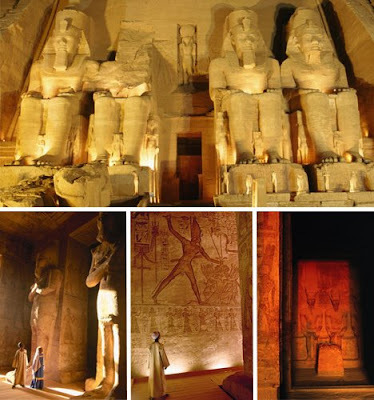 Commissioned by Ramesses himself, the temple faces east so that twice a year, the sun’s rays reach into the innermost sanctuary, lighting up the statues of Ptah, Amun-Re, Ramesses II and Re-Horakhty. The complex was relocated entirely from its original setting in the 1960s to avoid being flooded when Lake Nasser was created. 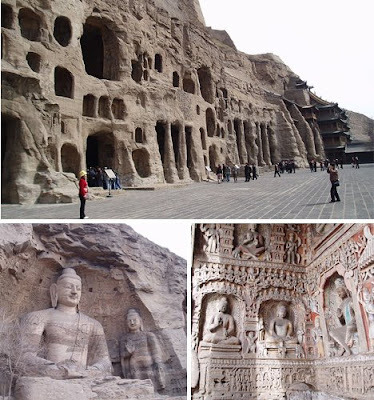 The Yungang Grottoes of Datong in the Shanxi province of China are comprised of 53 caves and 51,000 statues, and are one of China’s most beautiful examples of cave art. Giant Buddhas tower over visitors who wind through the caves viewing the many sculptures inside. 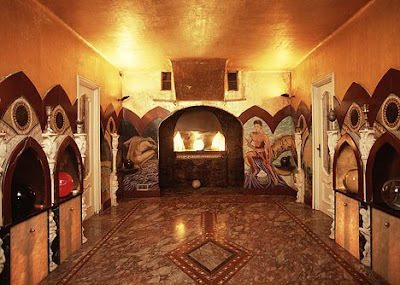 Much of the artwork that was once inside the grottoes was stolen in the early 20th century and the wooden temple buildings that once protected the caves burned down. So, the site is now in urgent need of protection and has been named a UNESCO world heritage site. 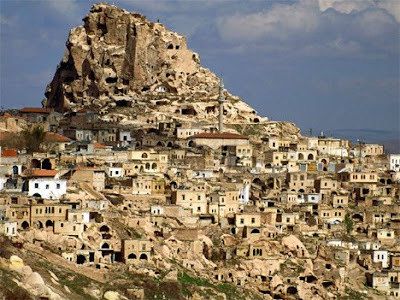 Cappadocia is one of the 73 current provinces of the Republic of Turkey, and has one of the most strange and fascinating landscapes of the world. The rocky, scrubby land features bizarre volcanic ‘tufa’ rock formations referred to as ‘Fairy Chimneys’ as well as complex underground cities and buildings cut from the soft ‘tufa’. Many of these are churches, with columns and arches decorating the stony face of an otherwise natural hunk of rock. 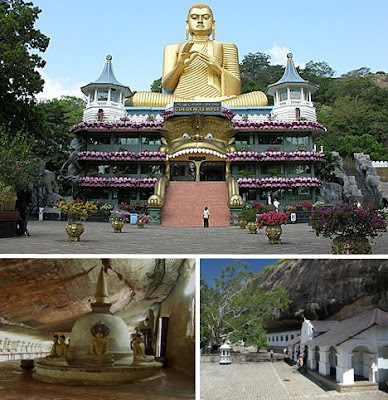 Carved from a giant rock in Sri Lanka, the Golden Temple of Dambulla was once a set of caves inhabited during prehistoric times and then used for pre-Buddhist ceremonies. The temple was built and decorated in 89 BC by King Valagambahu. Inside, the cave ceilings and walls are painted with religious images that follow the contours of the rock. 150 statues of Buddhist order, figures from Sri Lankan history and a few statues of Hindu gods. A 14-meter-tall Buddha statue carved from the rock dominates the first cave as you enter. 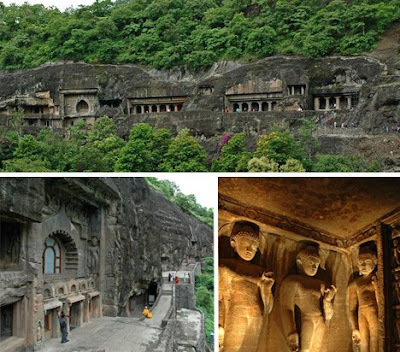 Like the Ajanta Caves, the Ellora Caves are located in the Indian state of Maharashtra. 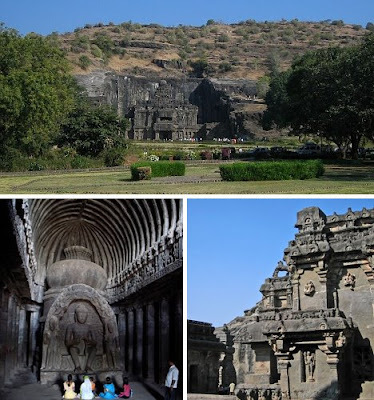 Carved from the Charanandri hills between the 5th and 6th centuries, the Ellora Caves were built just as Buddhism was declining in India and Hinduism was once again becoming more popular. 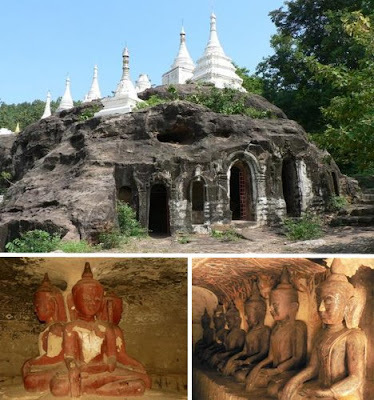 As a result, there are both Buddhist and Hindu caves within the complex, with a rich variety of religious art including many elaborately carved shrines. 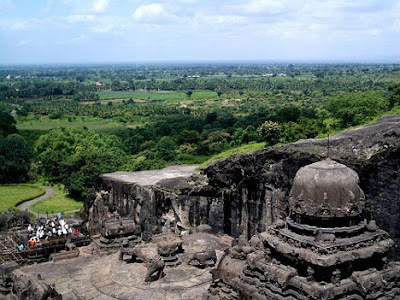 The Ellora Caves are highly valued today as an example of the country’s tolerance of both religions. 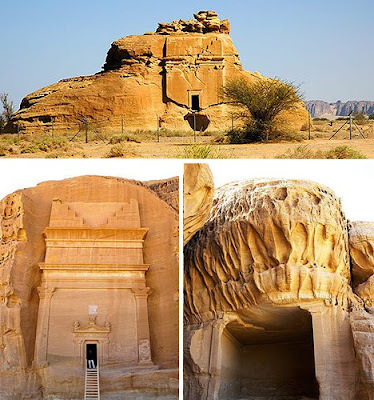 Among Saudi Arabia’s best-known architectural sites is Al Hijr, also known as Madain Saleh. 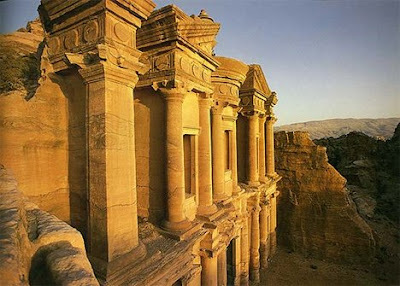 The facades of the dwellings in Al Hijr were carved into the sandstone mountains sometime in the second millenium BC. 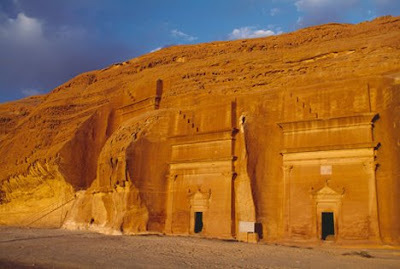 Al Hijr – which literally means ‘rocky place’ – is believed to have been inhabited by the Nabataeans and the Thamud. It features water wells, well-preserved monumental tombs, inscriptions and cave drawings. The Dazu rock carvings in Chongqing, China are hewn from the cliffside, featuring more than 5,000 statues and over 100,000 Chinese characters of inscriptions or epigraphs. Though Buddhist statues dominate, Taoist and Confucian figures can also be seen which is rather rare in Chinese grotto art. The carvings were made in 650 CE in the Tang Dynasty and continued in the Ming Dynasty (1368-1644) and Qing Dynasty (1616-1911). The city of Petra in Jordan is known as a setting of the movie, Indiana Jones and the Last Crusade. It’s also one of the new 7 wonders of the world, and it’s easy to see why – its majestic rock-cut architecture is among the most sophisticated ever seen. Built into the slope of Mount Hor, Petra flourished during Roman times but was unknown to the western world until 1812 when discovered by Swiss explorer Johann Ludwig Burckhardt. 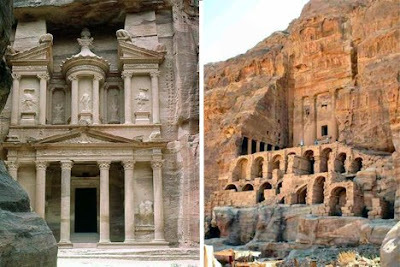 Over 800 individual monuments can be seen in Petra, including tombs, baths, funerary halls and temples. 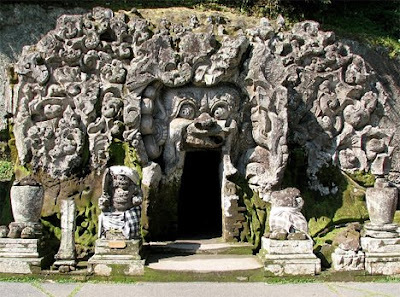 Goa Gojah, the Elephant Cave Temple, is one of Bali’s most historically significant sites. The cave was apparently partially destroyed by a natural disaster long ago, and was undetected for centuries until a team of Dutch archeologists stumbled upon it in 1923. Thought to have been built in the 11th century, Goa Gojah features statuary influenced by both Hinduism and Buddhism and contains secret meditation chambers for priests or hermits. Two traditional bathing pools outside the cave contain water said to have magical properties. In the Ruse area of Bulgaria, there are a set of monolithic churches, chapels and monasteries hewn from solid rock known as the Churches of Ivanovo. Though the presence of these churches in the cliffside is impressive in itself, the structures are best known for their beautiful and well-preserved medieval frescoes. Christian monks dug out the caves and made the churches in the 13th century and though it’s a bit easier to access now, centuries ago people had to climb the cliff with ropes to get inside. Viewing photos of the Temples of Damanhur, carved into the rock under the village of Valchuisella, Italy, one might think they’re an ancient wonder. But what the Italian government has deemed “the 8th wonder of the world” is actually a modern product of one man’s very active imagination. A 57-year-old former insurance broker created the ornate temples, occupying almost 300,000 cubic feet, in secret over a period of 16 years. 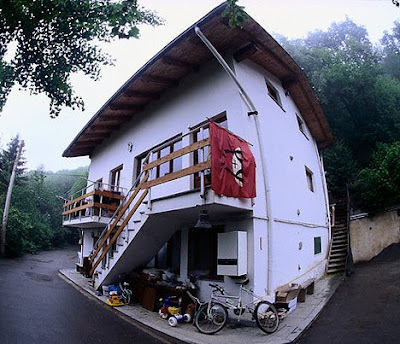 Oberto Airaudi selected the hillside for its sturdy rock, built an unassuming house and began excavating underneath it. 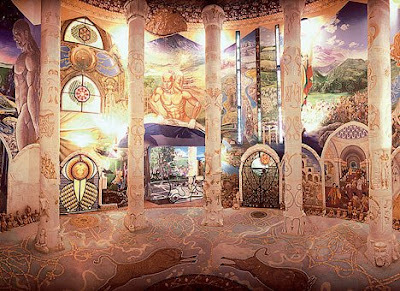 The self-described ‘paranormal’ eccentric had volunteers work in 4-hour shifts to create the nine chambers full of astonishing murals, mosaics, statues, secret doors and stained glass windows. Airaudi’s entire story is a long and bizarre one, and though some may deem his creations a bit gaudy, the fact that he pulled all of this off certainly is amazing. simply could do with some % to force the message home a little bit, however other than that, this is magnificent blog. A great read. I will certainly be back. an extremely neatly written article. I'll make sure to bookmark it and come back to read extra of your helpful info. Thank you for the post. I'll certainly comeback.